probably it will be closed when you are looking but don't worry we also gathered gadget instructions for better analysis. 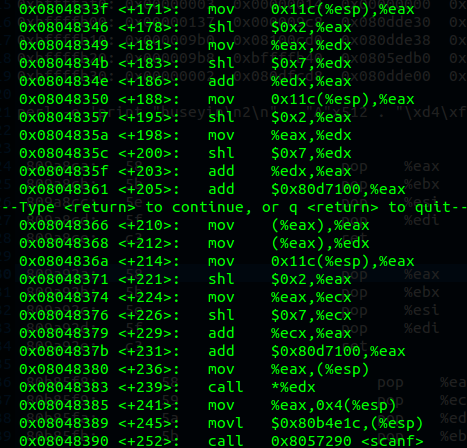 it is using fgets to get from stdin and also gathering 256 bytes (till the newline, or eol). you can see the memory layout and gadget adresses at the top of the source. ** GDB and the real stack addresses were different due to initial stack alignment and by testing we found out that real offset would be 32 bytes away from the gdb's stack. Hi, how did you find the exact address of name outside gdb in the remote machine? Hi, what did you call syscall 11 for ? Btw, I can't connect to the ssh server, I can't seen where they gave the password ?